It’s likely not many things can shock you. You’ve been a trailblazer… a leader… you read blogs to expand your knowledge (well done!). So this digital thing that everyone keeps talking about is somewhere you need to be trailblazing. Things are happening here… you just may not know the depths of them. Yet. And the first place to look is on your website — through Google Analytics goal set up. If you’re new to Google Analytics – one of my favorite places to lurk about – check out this post on the reports you should be paying attention to as a primer. This seemingly limitless reporting tool can be a bear but if you tackle it in waves, it’s a little less intimidating. Like cleaning your house… or a new exercise routine. Small chunks are easier to digest. Google also has a beginner’s course you can check out. 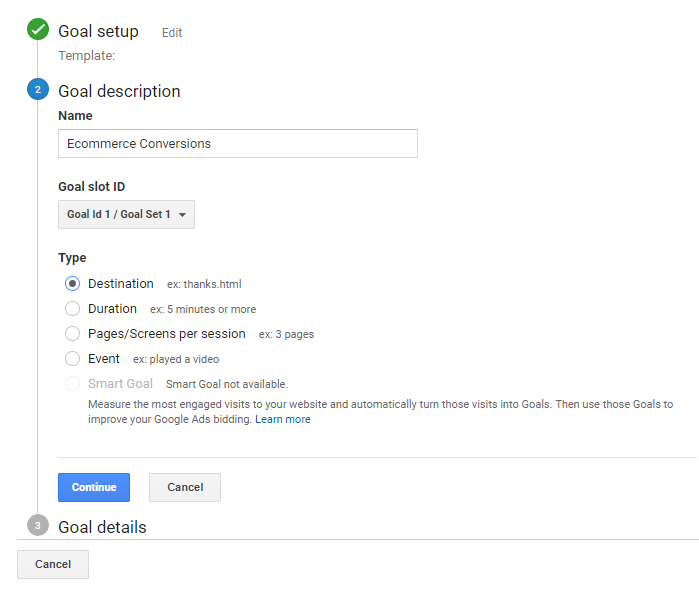 Why Do You Need a Google Analytics Goal Set Up? This free (!) digital tool keeps track of your website visitors, and you can glean a lot just by seeing what web pages they frequent, how many pages they visit, and if their path leads to an online sale. It’s this last bit that we’ll concentrate on since, hey, we all want to make more money, right? Where did a conversion originate? Organic search? Email? Referral? How many new users to the website are converting? How many pages did this new user visit before converting? Convinced? Below, I outline a Google Analytics goal set up for an ecommerce sales conversion. Let’s do this! Once logged into your Analytics account, click on the Admin icon at the bottom of the left-hand navigation… it’s the wheel spoke looking thing. On the far right in the Admin, under View, click on Goals, then click Add New Goal. 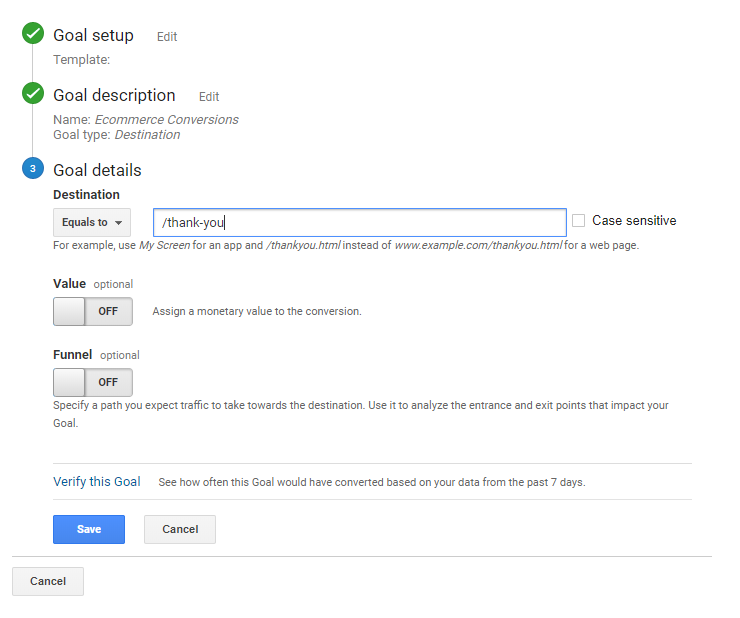 Now you’re ready to set up your Google Analytics goal. Since we’re not setting up anything too complicated, keep the Template setting in place and click Continue. In the Goal description box, name the goal whatever you want and keep Destination as the Type. If you’re wanting to track video views, you’d use Duration as the Type, or if tracking some more complicated metrics, then you’d choose Pages/Screens per session. Event Type is more of a Google Analytics 201 goal that we’ll cover in a later post. So once you’ve filled in your goal’s name and Type, click Continue. Now we’re getting to the nitty gritty. Since this is a sales conversion goal, the sale gets tracked online using the “thank you” page generated for the customer. The URL for that is usually something like /submit-order or /thank-you or along these lines. If you don’t know it, create a fake order in your ecommerce system to get the correct URL. It’s imperative that it be exactly as it looks—if the URL address has a / after it, include that. And when you enter it into the field, you don’t need to list your whole website address. For instance, use “/thank-you” versus “http://awesomewinery.com/thank-you”. Once you have the correct “thank you” URL, in the “Equals to” box, cut and paste the website URL. The other fields and pull down menus you can leave turned off until you get a little more advanced. Those are cool tools, but more like Google Analytics 201 or 301 level features. When the URL is all good and dandy, click the link “Verify this Goal” and the system will tell you how often in the past 7 days this goal has been achieved. Hopefully, if this is a sales goal, then someone has purchased in the past 7 days. If it registers 0 and there have, indeed, been ecommerce purchases, then something isn’t set up right. Go back through these instructions and check everything. When verified, click Save and you’re good to go. The system will track conversion in the Acquisition report (and other areas) starting from when you click Save. The data doesn’t generate retroactively, unfortunately. 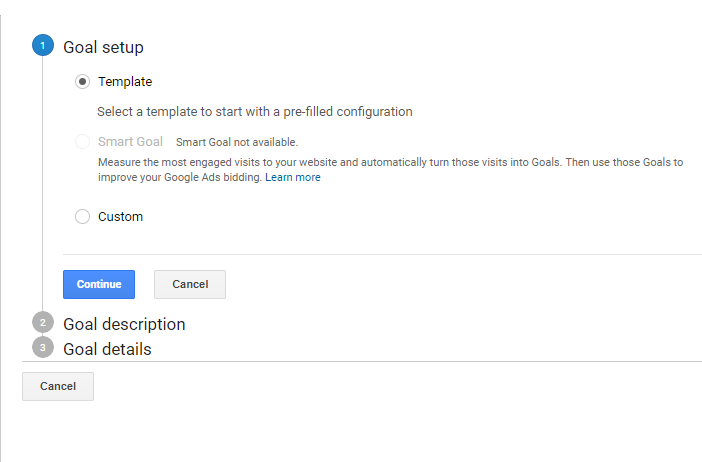 You can set up Google Analytics goals for a lot of things: online reservations, white paper downloads, forms, video views, or email sign ups, among others. Basically, anywhere you want to track conversions long-term on your website. Keep in mind, Google only allows 20 different goals, but know that you can also reuse some. Happy tracking! If you need help with anything on Google Analytics, hit me up.